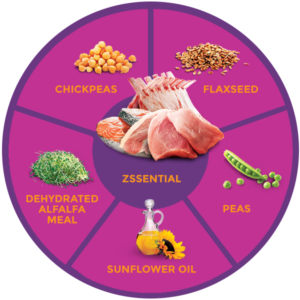 Our Zssential Formula provides a combination of protein sources across the board to maximize the nutritional benefits that each type of protein has to offer. It brings together red meat, poultry, and fish to create the most complete food for your dog. In addition to a wide variety of vitamins and minerals, Zssential also provides a nutritionally correct ratio of fruits and vegetables that rounds out the recipe with powerful antioxidants and fiber-rich low-glycemic carbohydrates. Zignature Zssential® Formula – Learned from Nature, Crafted to Perfection. Turkey, Turkey Meal, Salmon, Lamb Meal, Duck Meal, Chickpeas Flour, Pea Flour, Peas, Chickpeas, Dehydrated Alfalfa Meal, Flaxseed, Sunflower Oil (Preserved With Citric Acid), Salmon Oil, Natural Flavors, Choline Chloride, Salt, Cranberry Meal, Dicalcium Phosphate, Potassium Chloride, Calcium Carbonate, Minerals (Zinc Proteinate, Iron Proteinate, Copper Proteinate, Manganese Proteinate, Cobalt Proteinate, Zinc Sulfate, Ferrous Sulfate, Zinc Oxide, Copper Sulfate, Sodium Selenite, Manganous Oxide, Calcium Iodate, Cobalt Carbonate), Taurine, Vitamins (Vitamin A Acetate, Vitamin D3 Supplement, Vitamin E Supplement, Niacin, d-Calcium Pantothenate, Thiamine Mononitrate, Pyridoxine Hydrochloride, Riboflavin Supplement, Folic Acid, Biotin, Vitamin B12 Supplement), Dried Kelp, Blueberries, Preserved With Mixed Tocopherols, L-Carnitine.